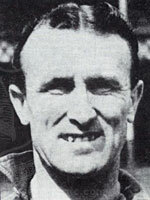 Tommy Eglington joined Everton from Shamrock Rovers on the same day as his Milltown teammate Peter Farrell in June, 1946. A superb professional whose dedication to training was reflected in a remarkably injury-free career, Eglington made 24 appearances for the Republic and six for Northern Ireland. Although he scored just two goals for the Republic, he is best remembered as a creator of chances for those inside him. As one of the most effective of players of his generation, 'Eggo' on the burst was one of the great spectacles at Dalymount. His acceleration over ten yards was spectacular and his ability to deliver a precise pass at speed his trademark. 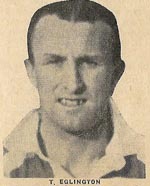 Eglington went on to make 450 first team appearances for Everton and with Peter Farrell, laid the basis for a dynasty in which more than half the first team at Goodison Park in the mid-1950's were Irish. Perhaps his most memorable game was the 4-0 victory over Austria at Dalymount Park on March 25, 1953 which made amends for the 6-0 drubbing by the Austrians in Vienna the previous year. Last 10 games in which Tommy Eglington scored. Games in which Tommy Eglington was a Substitute.